This morning I went to church with my host family for the second time. Carlos Perez, the father in the family I am living with, is the preacher at the Hispanic Church of Christ up the mountain. He also preaches at a church in Fort Payne. Going with the family is always fun and an experience because everything is in Spanish. 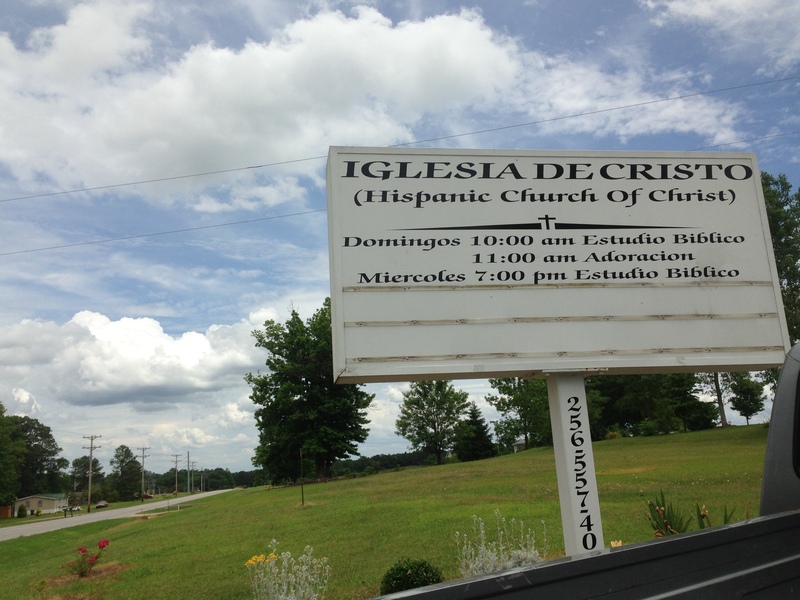 I used to go to a Spanish service in my hometown of Decatur sometimes but nothing could have prepared me for the amount of Spanish I absorb at this church. 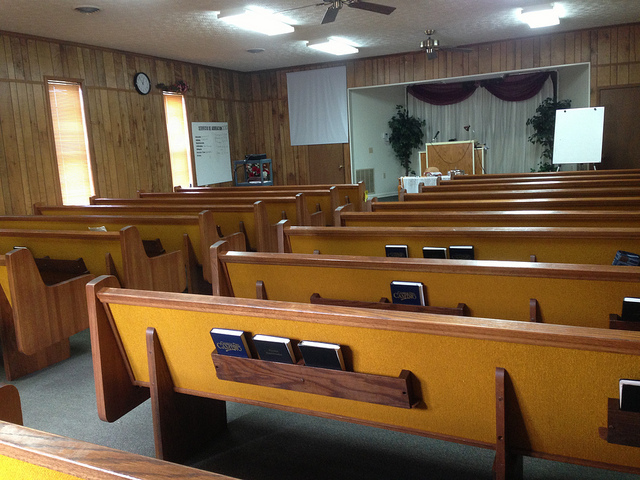 When we first get there, everyone meets in the sanctuary to pray and sing songs. Because it is a Church of Christ, there is no musical accompaniment to the songs. We just sing them out of a songbook, which makes me grateful for my ability to read music, one thing that helps me keep up with people who have known these songs for their whole lives. 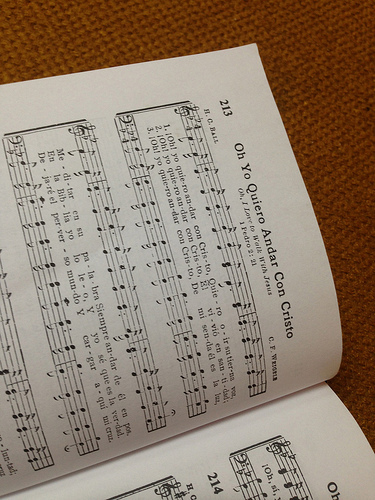 It also helps that some of the songs are actually Spanish versions of hymns I am familiar with in English. Everyone sings loudly and regardless of musical ability. The loudest singer in the room sits behind me. Even though he sometimes completely switches keys, hearing him sing makes me happier than anything because he is so joyful. After a little bit of singing, the kids and the youth go into separate rooms for Sunday School while the adults stay to be taught in the sanctuary. The Sunday School lesson is the most difficult for me because the man who teaches the youth speaks so incredibly fast that I can only catch bits and pieces of what he’s saying, but everyone is so friendly and welcoming that I don’t feel uncomfortable at all. In the regular service there is more singing, offering, communion, prayer, and a sermon. It’s interesting because it is not really different than any church service I have been to in my life. But the language is different. When Carlos is preaching, he is easy to understand because he speaks slowly, and I am used to hearing his voice. At the end of each service I have attended, he has mentioned to the whole congregation that I was there. The first week, he had me stand up and greet the congregation and told them to speak to me only in Spanish because it was everybody’s job to help me practice. The people of the church have been extremely welcoming, asking me about my Living Democracy projects and passing off their babies for me to hold. Going there already feels like going home. What is interesting about this church compared to others that I have been to is how extremely close it is. It is a small church, and operates somewhat like a big family. In addition to the normal Sunday morning and Wednesday evening services, they also have a Friday night meeting in the homes of different church members where they eat, fellowship and worship together. Carlos also goes to Gadsden two nights a week to do prison ministry, and he preaches in Fort Payne on Thursday and Sunday evenings. Carlos and his wife, Maria, are often out later than I am. Because of their commitment, they usually spend some time visiting in the homes of church members. Church, especially in the South, is definitely a big part of community. Jennifer Wilkins, my community partner, is very active in the Collinsville First Baptist Church, and Myles Smith, my other community partner, is an elder in the Collinsville Church of Christ. It was actually Myles, along other members of the church, who hired Carlos and brought him and his family here from Mexico so they could pastor a Hispanic congregation. The house we live in is actually the parsonage for the Church of Christ. For Jennifer especially, the church is the backbone of the community. 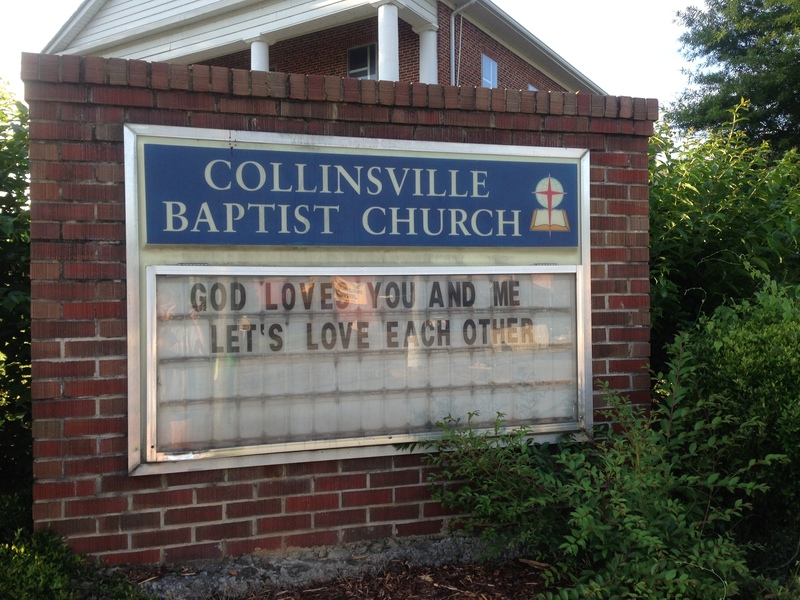 Collinsville doesn’t have a newspaper; so church bulletins and newsletters are some of the most effective ways to disperse news throughout the town. Jennifer told me that having such a strong church family helps her get her through hard weeks, and I think that is true for many people, especially in small towns. The church really does play a huge role as a community pillar and provides a place where different families and individuals can come together to meet and worship and get to know and love their neighbor, and really, what is community about if not that? After my second week in Collinsville it’s starting to feel more like home. I was so very lucky this weekend to have an Auburn friend who is from Gadsden spend part of the weekend with me. Together we embarked on a true Collinsville experience: Trade Day. If you tell someone you are from Collinsville, or in my case, living here for the summer, if they are familiar with the area at all they will probably ask if you know about Trade Day. 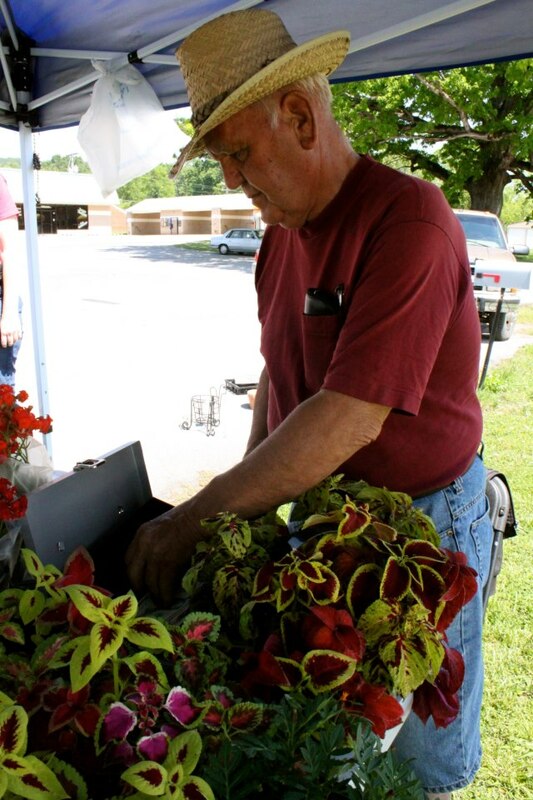 Trade Day happens every Saturday in Collinsville, rain or shine, all year round. It’s a flea market, bargain sale, animal auction and farmer’s market all in one giant, almost sacred space. And it is wonderful. Katie, my visiting friend, actually has some experience with Trade Day since she’s from the area. This was only my second time to go, with the first time being sparsely populated due to the temperature being in the high 30s, so her guidance was welcome. We began the morning fairly early, stopping at the Piggly Wiggly to get cash back and snacks to begin our voyage. The road was packed because this was not just a normal Trade Day weekend. It was also Antique Alley weekend, and the entire street was lined with yard sales. Katie wanted to go to the animal section first since “they go early” – and indeed, animals are a hot commodity at trade day. One brilliant vendor was selling leashes right next to the animal area, and I’m sure he did great business, because many, many people leave Trade Day with new pets. If I wasn’t a college student, I would have probably ended this Saturday the owner of multiple free kittens, a boxer puppy, and possibly a goat. All kinds of animals were available, ranging from the typical kittens and puppies to ducks, chickens, goats, sheep, and even peacocks. 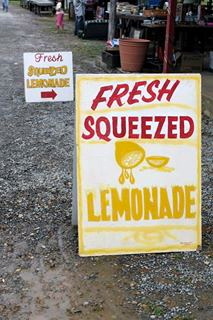 Trade Day features treats from lemonade to pies. After seeing the animals we ventured into the main part of trade day – the goods. I saw booths selling everything I could possibly imagine, from cast-iron cookware and locally made candles to work boots and tools to discount hair products and a huge selection of $5 DVDs. There were handmade birdhouses and vintage odds and ends, never ending stacks of books, flowers and plants, and children’s toys. One of my favorite booths featured ammo and puzzles, which I found to be an intriguing combination. Being from the area, Katie actually knew a handful of people with Trade Day booths. I briefly got to meet the “funnel cake family” which is, in all honesty, a family I was very happy to become acquainted with. This was also the moment I realized the pure beauty of living so close to an event where I can easily obtain funnel cakes EVERY SATURDAY for the rest of the summer. She also introduced me to another family, the “pie family” who worked a booth that sold delicious biscuits and miniature pastries. I had actually already met the son of the family at the gym, which just goes to show you that in a small town, everything is connected. Moments like that are, of course, why people actually go to Trade Day. For every person there because they really want to buy a new wrench or some flowers or chickens, there are probably three or four who are there because it’s a nice way to get out of the house and encounter your neighbors. Meeting with others is essential to community- you cannot be a community alone. I was fortunate enough to attend a meeting last week hosted by the Alabama Cooperative Extension System. The purpose of the meeting was for different community organizations and leaders to gather together and discuss how better to serve the Hispanic community of North Alabama, which is extremely relevant to Collinsville, which is almost 44 percent Hispanic. The leader of the meeting was Dr. Paul Waddy Jr., the state leader of Diversity and Multicultural affairs for the Extension System. One of the most profound things he said at the meeting has resonated with me ever since. I have the quote scribbled in my notes because I found it so relevant to everything we do and are trying to do with Living Democracy. He said, “We need to cross the street and shake hands with one another and that’s another way to eliminate some of the problems.” I thought that was such a beautiful way to verbalize something so true: for us to solve problems in our community, we have to BE a community, and that means meeting with our neighbors and getting to know them. And Trade Day in Collinsville is a sacred event for that reason: it gives people in the community a place to shake hands. My first week in Collinsville is in the books, and I feel like I’ve lived there for an entire summer already. We’ve gotten some good work done on our projects, but in reality, most of the week has been devoted to settling in, exploring, and meeting people. Something we talked about a great deal in preparation for this summer is the concept of “third places” – places in the community where people casually encounter each other. These places differ from official meeting places in that there is no set time or plan for interactions there; it spontaneously occurs. They’re essential to healthy communities though. The definition of community involves people meeting together, and for people to meet and form authentic relationships, they have to be able to do that naturally. Third places are where community is built. One of the best third places I have experienced this week is Jack’s. Being a longtime Jack’s lover (it’s my favorite fast food restaurant) I was very excited to find out that my community had one, and even more excited to find out that it was such a crossroads of community. There’s a group of men who meets there for breakfast every morning, which includes Myles Smith, one of my community partners. I ate lunch there twice this week with Myles. I met a host of interesting people there, including a former mayor, two chicken farmers, and a woman who is one of twelve siblings. Every time we go back, I am introduced to someone else from Collinsville, and I love it. Another thriving third place is the gym I joined. The time in the evening I have been going is apparently a very popular time for high school students to work out, because every night it has been packed with people working out, talking, and laughing together. Everyone noticed that I was the new girl in town right away, so on my second night there, someone introduced himself to me. After a few minutes of talking we discovered that he is friends with the daughters in my host family and actually goes to the church where my host father preaches. On the same night I met him, I had sat next to his mother at Bible study just an hour before. I’m very lucky because my community partner, The Collinsville Public Library, is a thriving third place. In a time when most public libraries go undervalued and underused, the Collinsville library is filled with people every day. People come to get books, use the computers and internet, make copies, have meetings, or just to spend time with their neighbors. It is a beautiful facility, located on Main Street downtown, and functions as a hub of community for all different members of the Collinsville population. The library is on the first floor of a recently renovated building, and the second floor is still in the process of renovation. The annual Friends of the Library Plant Sale was held this Thursday and Friday to help raise funds for the renovation efforts. Various local gardeners, nurseries and businesses donated plants and flowers, and we set up a temporary plant stand in front of the Collinsville Drugstore. I was fortunate to spend all day Thursday sitting under the tent at the plant sale meeting locals. As Myles said, “40 percent of it is for the plants, but 60 percent is for the library.” People came by, many commenting that they didn’t need anymore plants this season or would be doing well to plant what they already had, but no matter what they said about needing plants or not, they bought some out of love for their library and a desire to help their community. Vick, Pam, and Mrs. Weaver offered their gardening expertise to customers while Myles and I handled the money and chatted with the visitors. More than once someone came by just to say hi and tell us that they would be back the next day to buy their plants, and Myles bought plants for friends who were unable to make it but planned to pay him back Sunday at church. When the Collinsville school bus drove by, a couple of children yelled out the window “Hey Mr. Myles!” and car honks weren’t an uncommon form of greeting. I’m so excited about my weeks to come in Collinsville. I’ve already seen so much of the good in this community- people who love their hometown, who are so willing to help in any way they can and who are ready to welcome a stranger like me into their community. More adventures are to come… so stay posted! Bolts of brightly colored fabrics line the wall. Finished quilts hang from display cabinets and spread over an old rocking chair. A large working table in the back is covered with all of the indications of a quilt in progress: a yardstick, fabric pieces, and a pencil sketched drawing of the planned design. But this is no normal fabric franchise: this is A Time To Sew, the quilting specialty shop that graces downtown Collinsville. The store’s name, which is a pun on the phrase “a time to sew” from the Biblical book of Ecclesiastes, is written in grey script letters on the front window of the store, accompanied by the verse reference, Ecclesiastes 3:1-8. 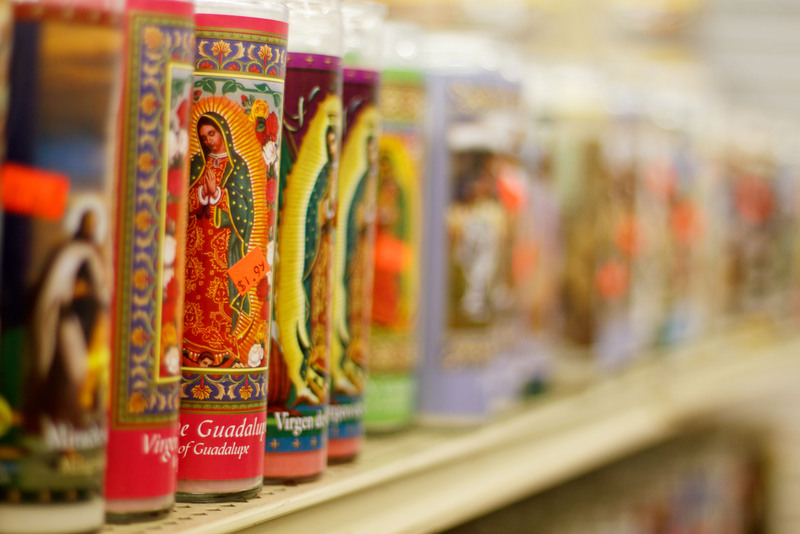 The Bible verse isn’t the only indication of faith inside the store. 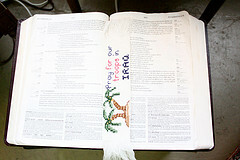 An open Bible on the front table marks the passage in Ecclesiastes with a cross-stitched bookmark reading “Pray for our troops in Iraq”. More of the bookmarks, made by members of a local church, sit nearby for purchase. 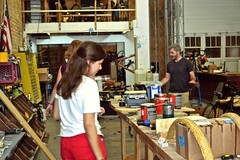 The store overflows with personal touches. Next to a small basket containing bundles of fabric squares sits a note encouraging shoppers to “grab some as a small gift to quilting friends” or “treat themselves to a little gift.” Next to the cash register sits a plastic bucket full of change being collected for the effort to restore “The Cricket”, the local historic theater down the street that stands in desperate need of repair. After a few minutes of talking with Mamie Moore, the owner, it becomes apparent that faith and history are two very important facets of her life and her business. She is an active member of the Collinsville historic society and knows everything there is to know about the theater’s history and the current restoration efforts. Mamie plans, designs, and prints the booklets commemorating Collinsville’s Turkey Trot, a yearly tradition that celebrated it’s centennial this past fall. Jennifer Wilkins, Collinsville librarian, says that she “has always been a big supporter of Collinsville School and Collinsville Public Library” and talks of Mamie’s part in beginning the quilt walk, a yearly event that raises money for the public library. Eager to share her knowledge, Mamie points out an antique paper pattern hanging from a dress form in the corner, explaining that when fabric was too much of a luxury to be able to waste on pattern making, dressmakers had to use paper. 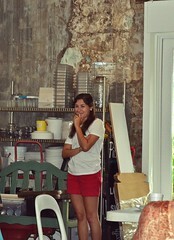 Leading to the back of the store, Mamie reveals one of her prides and joys: the old Collinsville jail. 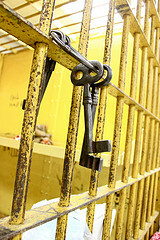 In the back room next to a table full of quilts sits a completely restored jail cell with all original fixtures. 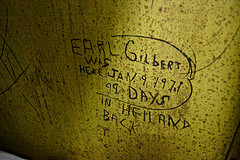 Writing scratched into the wall reads, “Earl Gilbert was here, January 9, 1971, 99 days in hell and back”. But the real treasure lies outside. Mamie leads through back doors and down the alley to the first Collinsville jail, a tiny white building that, at first glance, looks like a shed. The structure itself currently is being used as a storage facility, but Mamie shares her dreams of one day getting the jail cleaned up so she can continue her mission of preserving the history of Collinsville. So one day, if you’re visiting Collinsville, look down Main Street. 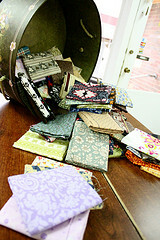 You’ll see A Time To Sew there, overflowing with color, history, and faith. Stop in, and Mamie will make you feel at home, and you’ll learn a thing or two while you’re there.